With the 76ers on a back-to-back and Joel Embiid questionable, the Bucks are solid road favorites in Thursday night's clash of East contenders. Giannis Antetokounmpo is back from an ankle injury, and the Bucks can seal the top spot in the East with a win Thursday in Philadelphia. 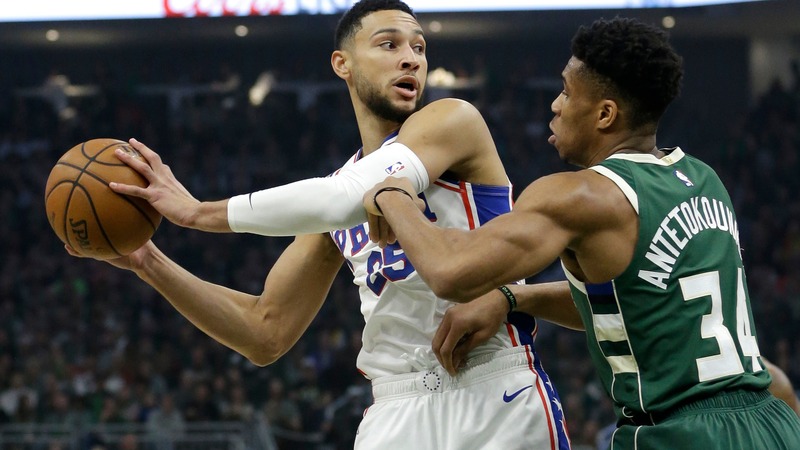 With the 76ers on a back-to-back and Joel Embiid and Jimmy Butler questionable, Milwaukee opened a 5-point road favorite at the Westgate SuperBook. The line was adjusted to -5.5 in the first few minutes of betting but back down to -4.5 shortly thereafter. Other bet shops stayed put at Bucks -5 on Thursday morning. The Bucks -- two victories away from the fifth 60-win season in franchise history but first since 1980-81 -- have the best against-the-spread record in the NBA. Milwaukee (58-20 straight up, 46-28-4 ATS) is coming off a 131-121 win at the Nets on Monday in which Antetokounmpo had 28 points and 11 rebounds. The MVP front-runner at -230 at FanDuel, Antetokounmpo is averaging 42.0 points, 17.0 rebounds and 8.5 assists in two games against the Sixers this season. In a March 17 meeting, The Greek Freak scored a career-high 52 points, but 76ers big man Joel Embiid had 40 points and 15 rebounds to lead Philly to a 130-125 win as 5.5-point underdogs. __MORE:__ [NBA win total update](https://www.betchicago.com/nba-win-total-update-over-under) Reports [earlier in the week](https://www.cbssports.com/nba/news/joel-embiid-injury-update-76ers-star-center-to-miss-remaining-road-trip-for-rest-expected-back-in-lineup-thursday-vs/) said Embiid is expected to return to the court for Thursday's home game, but based on the point spread, the betting market has its doubts. The star trio of Embiid, Jimmy Butler and Ben Simmons hasn't played many games together in the second half of the season with Embiid nursing a knee injury and Butler sitting out multiple games to rest and/or deal with back tightness. Philadelphia has a 2.5-game lead over the Celtics and Pacers with four games to play, all but securing its spot as the No. 3 seed in the East. The Sixers (49-29, 36-42 ATS, 30-9 home, 20-19 ATS home) are playing in the second game of a back-to-back after losing to the Hawks in Atlanta on Wednesday night. Butler (back tightness) played 34 minutes, and Simmons went for 15-15-8 in 33 minutes. For the 76ers, tired legs have often resulted in OVERs and ATS losses. OVER is 12-3 in the 76ers' last 15 games playing on no rest, and Philly is 3-8 ATS in its last 11 games on no rest. Thursday's total, adjusted from 231.5 to 230.5 at the SuperBook, may not be high enough, with OVER cashing in each of the past four meetings between these teams. With that, let's get to the rest of the three-game Thursday NBA card. __MORE:__ [Eastern Conference playoff race coming down to the wire](https://www.betchicago.com/eastern-conference-playoff-race-pistons-nets-heat-magic-hornets) ## Thursday NBA betting lines, odds, trends *Odds from the Westgate; all times Central; ATS records from [TeamRankings.com](https://www.teamrankings.com/nba/trends/ats_trends/?sc=all_games)* ### Cavs at Kings odds, 9 p.m. CLE: 19-59, 37-40-1 ATS, 6-33 road (worst in league), 18-20-1 ATS road SAC: 38-40, 44-32-2 ATS, 23-16 home, 24-13-2 ATS home __Spread:__ Kings -9.5 __Total:__ 228.6 __Moneyline:__ Kings -450, Cavs +370 __Betting tip:__ Kings are 11-4-1 ATS in their last 16 games following an ATS loss. ### Warriors at Lakers odds, 9:30 p.m., TNT GS: 53-24, 33-43-1 ATS, 25-13 road, 18-20 ATS road LAL: 35-43, 32-45-1 ATS, 21-17 home, 15-22-1 ATS home __Spread:__ Warriors -13 __Total:__ 227 __Moneyline:__ Warriors -1100, Lakers +700 __Betting tip:__ UNDER is 13-3 in Warriors' last 16 games. __Bookmark us:__ [Daily NBA betting coverage](https://www.betchicago.com/nba-betting) __PLAY:__ Our free [Daily NBA Pick 5 game](https://betchicago.chalkline.com/games/nba-pick-5). Pick five select NBA games ATS to win a BetChicago prize pack.